MATURE OAKS, PALMS AND palmettos line the streets of fashionable Dunes West, just off Highway 41 in Mount Pleasant, South Carolina, and home to Ellington Woods, a residential community designed specifi cally for the best in condominium living. An Alison Dailey Properties town home community, Ellington Woods offers a wide range of quality properties in contemporary and traditional styles. Its tasteful and functional designs offer two- and three-bedroom confi gurations with either two or two-and-a-half baths. These units feature a host of upgrades that can include hardwood fl ooring, double fans in some rooms, crown molding, garden tubs with separate showers, double vanities, programmable thermostats and gourmet hanging pot racks. Additional custom features available in many of these affordable town homes are gas fi replaces, screened porches, security systems, bonus rooms suitable for a home offi ce, exercise room or mud room and views of ponds or woods. Ellington Woods is located near all Dunes West amenities and to Mount Pleasant-s newest schools and recreational facilities. Residents who take advantage of membership in the Dunes West Golf Club can play a spectacular 18-hole, par 72 course designed by Arthur Hills, while a fi tness center, two swimming pools, lighted asphalt tennis courts, pro shops and a range of social events and programs are available at the Dunes West Athletic Club. Although Ellington Woods is surrounded by the serenity of the Lowcountry-s natural beauty, bordered by the Wando River and Wagner and Toomer Creeks and crisscrossed by tidal creeks, lagoons and marshes, a broad spectrum of retail shops and fi ne dining are only minutes away, as are the Atlantic Ocean beaches at nearby Isle of Palms. Town homes at Ellington Woods are priced to sell and homeowners- association fees are reasonable. 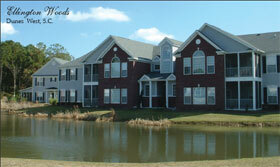 For additional information on this condominium-only neighborhood, contact Mike Terry at (843) 452-6038.